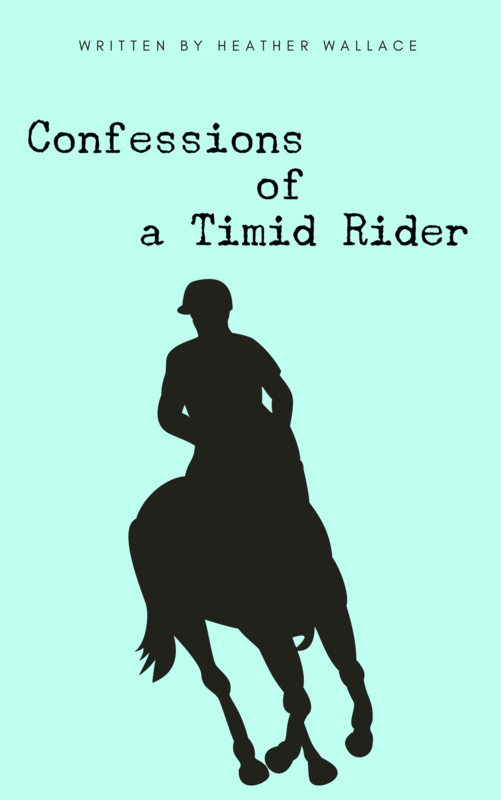 Confessions of a Timid Rider: I don’t own my own horse. My husband likes to point out all the perils of owning a horse. What if they get hurt, what if they get sick, what if we go on vacation, lose our jobs, etc. What about is the perils of NOT owning your own horse? I own a business that allows me to make my own hours and massage horses and dogs. Win-win. So I spend a lot of time at the barn. I go there to say hello to friends, human and otherwise, to massage clients, to take photos, and to take lessons. So I’m there all the time anyway. I might as well have my own horse. If I have time off to myself that leaves me to go shopping or something equally expensive. Yes, I have a spending problem. Having a horse is actually safer for my bank account. It will keep me out of trouble. Wouldn’t it be better and more cost effective too, to spend time bonding with my horse? Doing ground work, practicing what I’ve been working on in lessons, and getting more exercise? When you don’t own your own horse there are two options. You use the barns saddle pads, half pads, and girths clean or not. Damp from previous rides or not. You have to remember which saddle fits you best and pray you picked the right one so you don’t have to go through cinching the girth all over again. Then you have to adjust the stirrups because any number of people have used this saddle since you rode last. Chances are that no matter how well you eyeball those leathers, you’re going to have to adjust them when mounted anyway. Then remember which bridle fits your lesson horse, and pray that no one adjusted it for another pony, or borrowed it for a horse show and never took it out of their trailer. Like many others, you get tired of borrowing tack. So I went the other direction. Remember? Shopping problem. My “tack room” is in a corner of the garage. Scary isn’t it. When you don’t own a horse you have to lug all your tack (see Option 2 above) to the barn. Often I leave it in the car and I don’t have room for groceries, or the kids backpacks, etc. I do have priorities. When you don’t own your own horse you don’t get to store a tack box at the barn, or use a tack room. I have all the tack, but no place to put it. So I use my garage and car instead. Yes, I would rather keep it at the barn. There is nothing so amazing as watching your children enjoy the same passions. I’m a mom of three daughters. My oldest daughter has been riding since she was 4 and she’s better than me. Fearless. I’m scared and impressed at the same time. My 6-year old twins just started riding lessons and are loving every second. Now before you judge me, I flat out refused to let them ride for YEARS. They have been begging and begging, and I hesitated because this is an expensive hobby, sport, and lifestyle. I also didn’t want them to feel like this was something they had to do. And they’ve tried lots of other activities. But they often came with me to work on days off from school and they earned their way by cleaning tack, sweeping the aisles, and feeding the horses. There are so many benefits to growing up around animals and I love that my children have the opportunity. They may decide against it in future and they may come back to it as an adult like I did. It’s their choice. But not having a horse of our own means paying for 4 people to lesson at the barn rate. Not only are lessons less expensive if you own a horse, but you get more opportunities to ride, practice, and build confidence- so you are getting more for your money. Finally, the worst part about not owning your own horse is this. The horse that you love? The same one that accepts your bad days and challenges you to be a better, more confident rider, and forgives you when you aren’t? The horse that makes you laugh because he is so crabby, predictable, or just down right silly? The horse that you tell your secrets, troubles, and hopes too? The horse you didn’t know you needed? That is the same horse that could be sold at away from you at any time. The same horse that can leave your barn forever to another owner that may or may not appreciate him the way that you do. That, my friends, is the biggest peril of not owning your own horse. Want to find out if I ever own a horse? Join the herd today. So true! I couldn’t imagine not owning a horse ever again in my life! Wow, this is very true! I leased my horse for almost a year when I was told that he was going to be sold. I was in shock and I cried like a baby. The only thing I could do was to scrap up every penny that I had and buy him. So that is what I did. He is my heart horse and I never regret buying him. I have spent ALOT of money on him, but it is so worth it in the end, because I know that I will have him till the day he dies. I love that so much and think you’re relationship with Baldur is clear in your photos and blog. Delight is a special horse. He can be cranky but if he likes you, he will try so hard for you and he always takes care of his rider. I completely trust him. I would love to buy him and it’s my goal to do so, but justifying the money for board to my non-horse husband is difficult. I live in fear that his owner will sell him before I can buy him, but she promised to let me know first if she gets an offer. Luckily he’s not technically for sale (yet).